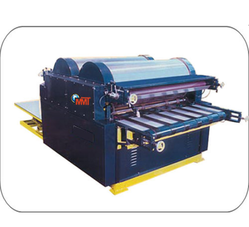 We are a Corrugated Sheet Cutting Machine manufacturer in India. 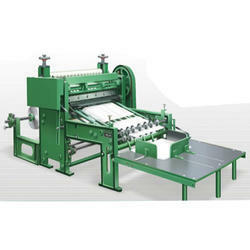 Aiming at maximum level of client-satisfaction, we are offering the Corrugated Sheet Cutting Machine which is manufactured strictly as per the specifications of our clients. These machines are highly reliable for longer service life and gives and excellent performance. We tested these machines with the help of our diligent quality auditors in order to ensure their flawlessness and greater operational efficiency. Suitable for cutting reel into sheets and cutting 2 plycorrugated liners (Can be synchronized with corrugation either electrically/mechanically). The machine is fitted with PIV gear box for changing the cutting lengths, variable speed pulley for increasing and decreasing the speed of the machine and a convey for traveling of sheets. Our clients can get a wide rang of Automatic Sheet Cutting Machine from our organization with assurance of quality, excellent performance and longer service life. We are a patron-oriented organization and manufactured these machines using ultra-grade raw material in accordance with their exact specifications. These machines are fully tested on different quality parameters in varied circumstances to ensure their excellent performance at the clients' sites. 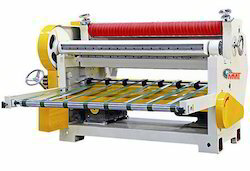 Suitable for cutting reel into sheets and cutting 2 ply corrugated liners (Can be synchronized with corrugation either electrically/mechanically). The machine is fitted with multile gear wheels for changing the cutting lengths, variable speed drive for increasing and decreasing the speed of the machine and a convey for traveling of sheets. Suitable for cutting reel into sheets and cutting 2 ply corrugated liners (Can be synchronized with corrugation either electrically/mechanically). The machine is fitted with PIV gear box for changing the cutting lengths, variable speed pulley for increasing and decreasing the speed of the machine and a convey for traveling of sheets. This production line is a semi-automatic production line, which is composed or paper roll stand, corrugated card board converting machine and paper cutting machine. 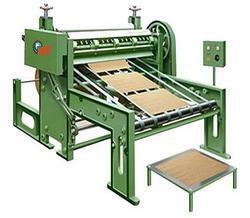 The line can continuously produce all kind of size single side corrugated paper. The line is the advanced process, high efficiency and can produce in large quality. It is an ideal equipment for middle and small size paperboard carton manufacture factories with improved technology. 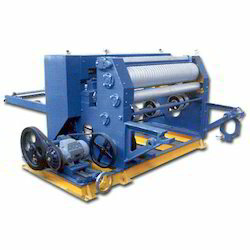 Suitable for cutting reel into sheets and cutting 2 ply corrugated liners (Can be synchronized with corrugation either electrically/mechanically). 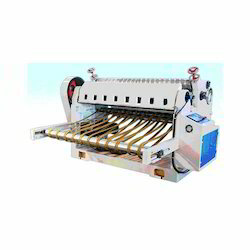 The machine is fitted with multiple gear wheels for changing the cutting lengths, variable speed drive for increasing and decreasing the speed of the machine and a convey for traveling of sheets.